The passage of Measure M promises to help clean up Aquatic Park and Codornices Creek. 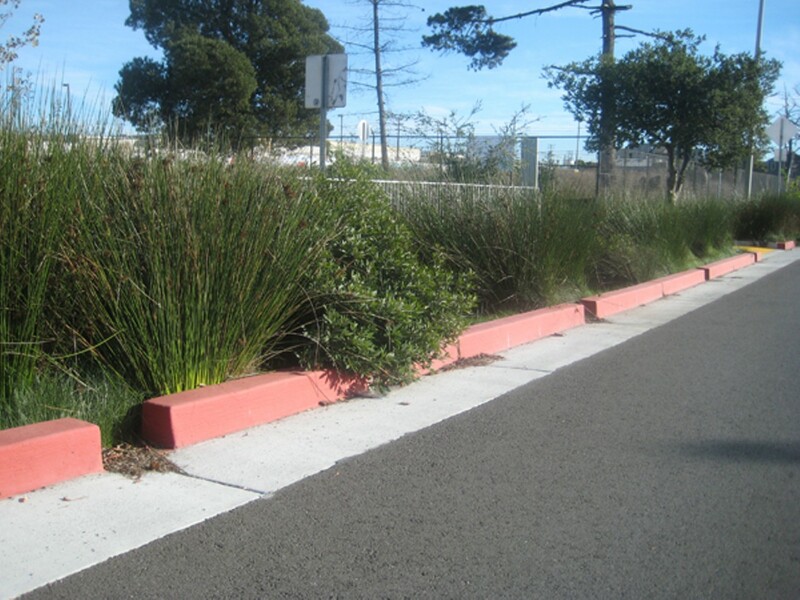 A bioswale in West Berkeley helps to absorb and filter stormwater runoff. As is the case in many other cities in the Bay Area and across the country, Berkeley's stormwater infrastructure is in sad shape. But help could be on the way. On Election Day, Berkeley voters overwhelmingly supported Measure M, a $30 million bond aimed at street and watershed improvements. The city also recently completed environmental review of its 2011 Watershed Management Plan, a one-hundred-page document outlining the problems facing the city's infrastructure and offering a mix of solutions. Most of Berkeley's 93 miles of storm drain pipelines are nearing or past their projected expiration dates. The system operates at or near its water-carrying capacity, meaning the pipes are not only too old but also too small. On top of that, tidal effects from the bay compound drainage issues in the southwestern portion of the city as far inland as Adeline Street. "All of the infrastructure is aging and coming to the end of its useful service," said Phil Harrington, the city's Deputy Director of Public Works. The result is frequent localized flooding throughout the Berkeley flats and the degradation of local waterways and habitats from high volumes of polluted runoff. In the city's largest watershed, Potter — which drains one-third of Berkeley's land area — the lagoons at Aquatic Park bear the brunt of runoff, receiving an influx of stormwater nearly every time it rains. Stormwater can carry heavy metals, chemicals, trash and biodegradable organics, oil and grease, bacteria and viruses, and excessive sediment and nutrients, all of which do more damage at Aquatic Park than they would through dilution in the bay. And improper discharge of stormwater into city creeks can cause stream bank erosion, damage to aquatic habitat, flooding, and groundwater depletion. Berkeley's Watershed Management Plan was developed as a response. But it's only the first link in a long chain of events that will need to happen before the city's most serious problems can be addressed. As city spokeswoman Mary Clunies-Ross put it, the watershed plan isn't prescriptive. While many of the solutions it proposes in the Potter watershed and in North Berkeley's Codornices watershed — the only two of Berkeley's eleven watersheds studied with any level of detail — are concrete, the rest of the plan is largely hypothetical. The intent, Clunies-Ross explained, was not to lay out a rigid approach, but to develop a rough blueprint allowing the city to pursue funding: Berkeley won't be able to firm up its plan without knowing how much it can spend. That's where Measure M comes in. The measure will generate $30 million in tax revenue to be used for street improvements and integrated green infrastructure such as rain gardens, bioswales, bioretention cells, and permeable paving, to "reduce flooding and improve water quality in the creeks and bay." Initially, the measure contained specific language related to planned improvements at Aquatic Park, but this was excised under a 6-3 vote by the Berkeley City Council in July — resulting in broader language that proponents decided would leave the city better positioned to go after grants. Mark Liolios, founder and director of stewardship group Aquatic Park EGRET, was among those disappointed by the decision to change the language. He had hoped to see Measure M explicitly fund a trio of projects costing $25.5 million, identified as priorities in the watershed plan, that would eliminate stormwater discharges into Aquatic Park from the Potter watershed's main storm drain. He and other Berkeley environmentalists, including the Sierra Club's Northern Alameda County group, which opted not to endorse the measure because it didn't commit to eliminating stormwater discharges into Aquatic Park, are concerned that the city may not follow through on the project. But leading Measure M backer Andy Katz, who represents Berkeley on the East Bay MUD Board of Directors, supports the city's contention that passing the measure was an important first step in completing the work. He also agrees that making improvements to the Potter watershed and diverting filtered stormwater around Aquatic Park and into the bay are top priorities. "The city would have the opportunity to match the bond funding with state bond funding, and combine those sources to complete the project," Katz said of Measure M. "That would be a significant improvement to water quality. ... The most important thing that Measure M will accomplish is protecting the water quality of Aquatic Park and [San Francisco] Bay." Yet just how that will be accomplished — and how the $30 million will be spent — remains deliberately vague. According to Harrington, it will be split between completing street-level projects identified in the city's Five-Year Street Plan and angling for larger grants to fund major infrastructure improvements. Potential funding sources for the latter include Proposition 84, earmarked for a wide array of water projects (though not those that discharge into a bay, ruling out the Aquatic Park improvements), and Proposition 1E, for disaster preparedness and flood protection. "Now we can at least say that we have a funding source to provide whatever the minimum match is," Harrington said, referring to the passage of Measure M, which was approved by 73.3 percent of Berkeley voters. "Without that bond passing, it would've limited our ability to do so." Based on extrapolations from analyses of the Potter and Codornices watersheds, the Watershed Management Plan calculates that $208 million is needed for stormwater improvement projects citywide. Of that, $65 million is in the Potter watershed alone. But next to the Potter storm drain and Aquatic Park improvements, Harrington believes the highest priority should be completing projects in the upper Codornices watershed, including upsizing a series of drainpipes for $1.6 million and adding new pipes for excess water storage in Codornices Park for $1.7 million. The adjacent Schoolhouse and Gilman watersheds see some of the city's worst and most chronic flooding along Second Street, where the street serves as a floodway for an undersize culvert below Interstate 80. The plan estimates a capital cost of only $115,000 to fix it, though it's unclear if that will happen with Measure M money. As far as the green street-infrastructure elements identified loosely in the plan — permeable paving, trees and tree well filters (which increase tree wells' ability to absorb and filter stormwater), bioswales, and rain gardens — Harrington says they'll start to appear in the next couple years in locations throughout the city where other street work is needed. "We want to overlap the Watershed Management plan with our Street Improvement Plan and see where the overlap is and focus on those," he said. "It allows us to at least get started."